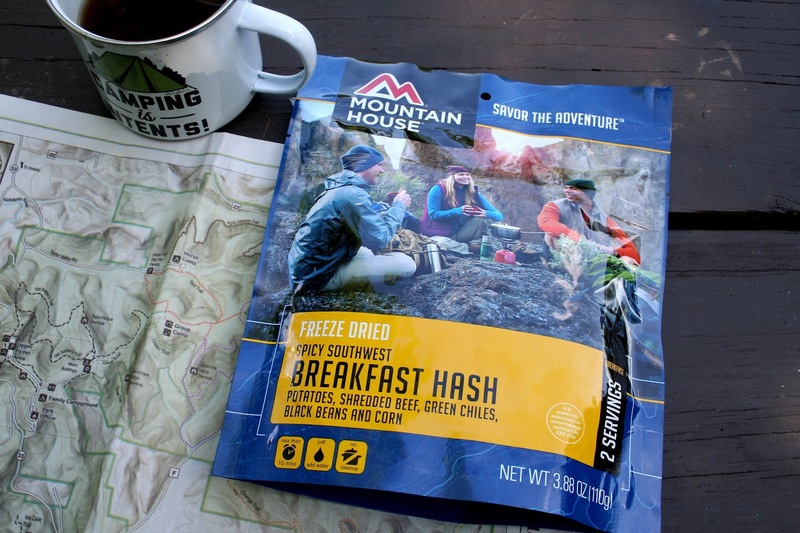 I've used Mountain House products for years, as they're perfect for backpacking when space for carrying food and cooking equipment is scarce. 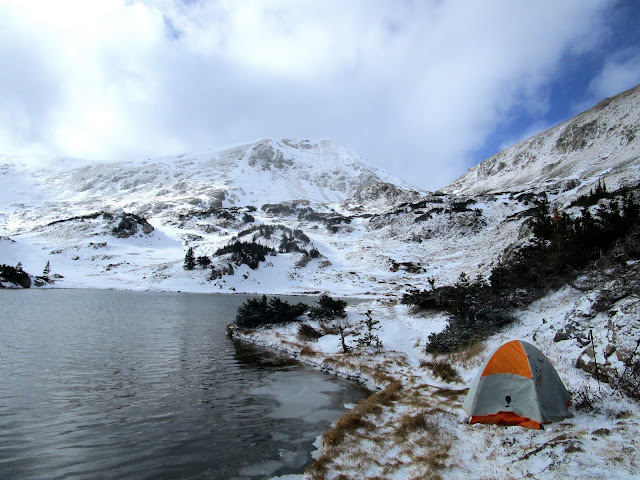 Opening the box at my apartment in Shorewood, I dreamed back to last October, when I was backpacking in the Colorado's Arapaho National Forest that sits next to Rocky Mountain National Park. It was the end of day two, descending in elevation from Parika Lake (11,365ft), I had just set up my tent in an off-trail clearing under thick lodgepole pines next to a creek and I was starving. Firing up my backpacking stove to boil some water, I had a glorious dinner of chicken and dumplings with vegetables ready in minutes. Not a bad way to end the day and catch the golden alpenglow radiating off the nearby snow-capped peaks of baker gulch. So with an already proven recipe for successful noms in the backcountry, I was eager to try out two new meal pouches from Mountain House on a recent car camping trip at a new-to-me state park. 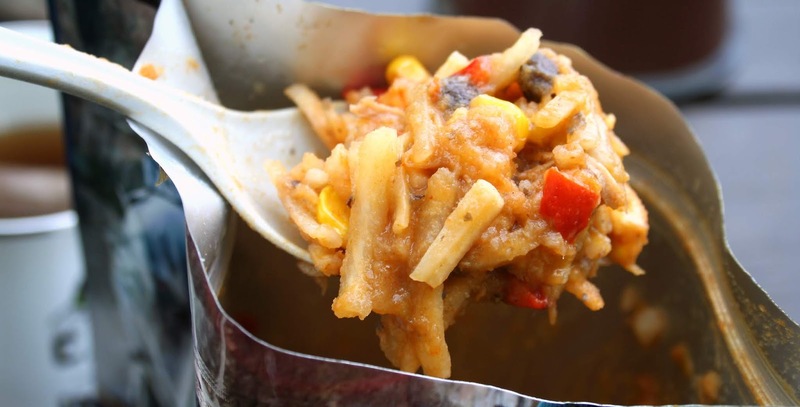 This review covers their Spicy Southwest Breakfast Hash. My second day at wonderful Wildcat Mountain State Park began with hot coffee and this tasty breakfast pouch you see pictured above. Letting the hot water do its magic and rehydrate all the filling goodies, I opened the pouch after about five minutes and stirred it a bit. It already looked drool-worthy, and after an ounce of patience, dove into the meal minutes later. Immediate reactions after the first bite triggered exotic sensations from my taste buds, and thankfully the contents weren't that spicy. Second bite, third, fourth- all continuously rich in flavor and I had no doubt in my mind that breakfast pouch's two-servings would be plenty for me and keep me full for the hours of hiking and kayaking that lay ahead at this 3,643 acre park in western Wisconsin's gorgeous driftless area. 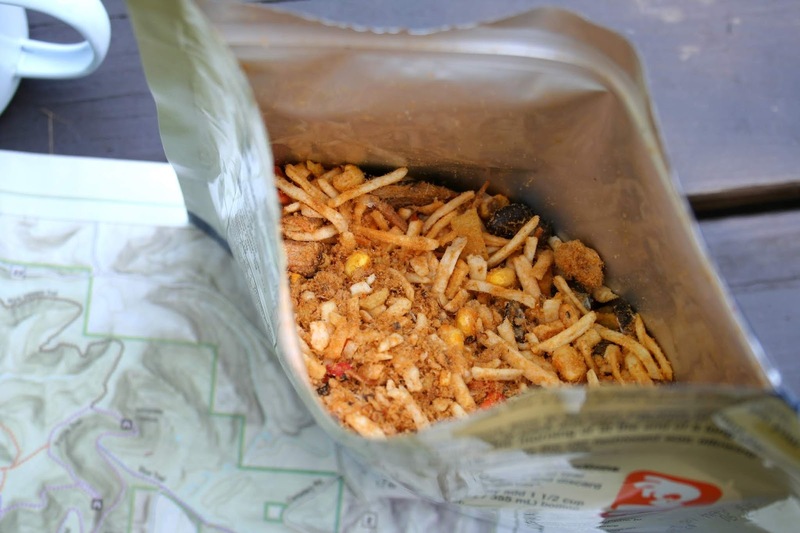 This --and any Mountain house freeze dried meal-- is super easy to make. Just add 1 1/2 cup of boiling water to the pouch, remove the oxygen pack first, let sit for about ten minutes and begin dreaming about this dehydrated feast you're about to throw into your stomach. With the morning sun above, prepare yourself for a warm and kickin' meal of potatoes, shredded beef, green chili peppers, black beans and corn. Yes, the word "spicy" on the bag was of course intimidating as I have the spice tolerance of a two-year-old, but this saliva-inducing breakfast was the perfect balance. Let's look at the nutritional facts. Each freeze dried pouch of Spicy Southwest Breakfast contains two servings, weighs 3.88oz or 110g dry, has (per serving): 250 calories, 9g of fat, 750mg of sodium, 31g of carbs, 5g of sugar and 11g of protein. Definitely an appropriate and healthy array of numbers there to fill an eager, breakfast-obsessed stomach like mine. Each serving also has 15% Vitamin A, 25% Vitamin C, 10% Iron, and 4% Calcium. When you're done eating, the pouch easily seals and rolls up compactly to be tucked away in a pack. The only drawback I noticed is that unlike other free-dried meals I've had in the past from other brands, the inside for the pouch doesn't have a "fill to" line, meaning that if you don't have an accurate grasp on how much water your boiling is, you'll have to fill a separate measuring cup. No biggie at all, but a tiny mark or crease, even on the outside of the bag, would be super helpful. Fall is the time of year I attempt to backpack as often as possible, and right now I've got a three day trip to Great Sand Dunes National Park in Colorado and all the way north to Wisconsin's Door County where I'll spend three days on remote Rock Island State Park, a desolate escape that requires two different ferries to reach. With great trips comes great planning and preparation, and I've already got my list composed of Mountain House free dried meals I'll be stuffing into my Gregory Baltoro pack. At less than $10, this is an ideal meal to eat around the campsite or in the backcountry before starting a day filled with hiking! Ready in just minutes, the Spicy Southwest Breakfast Hash wakes both you and your tastebuds up in the morning. Mountain House, again, continues to deliver and impress.